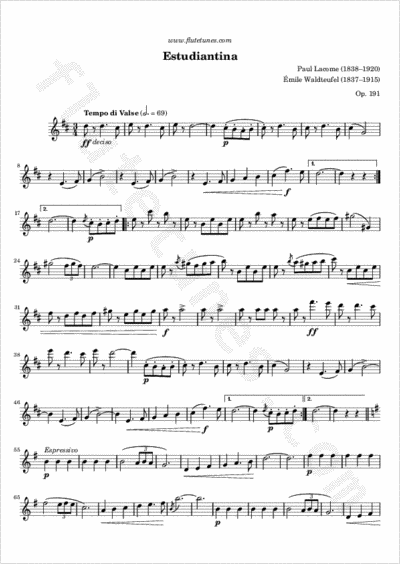 The Estudiantina Waltz, also known as the “Band of Students” Waltz, is an arrangement made in 1883 by French composer Emile Waldteufel, based on a melody composed in 1881 by Paul Lacome. The main melody is universally recognized by Americans of a certain age as the Rheingold Beer jingle that ran in the 1950s. Ironic that this melody, which many remember as the quintessential German Beer Hall tune, is actually of French, rather than German, origin; and was known as a French student song at first, then became famous as a piano duet, before it ever was heard in its now-familiar orchestral setting.